TYSONS CORNER, VA--(Marketwired - Nov 13, 2013) - A stay at The Ritz-Carlton, Tysons Corner is about more than simply a place to rest after a long day; it is about finding moments for reflection, exploration and discovery. The Ritz-Carlton Club® Level offers guests an elevated experience with dedicated service, a private lounge and additional amenities. Now, Club Level guests of this Northern Virginia luxury hotel can enjoy an added benefit to their accommodations with the Club Level Experience Series. The event series, available exclusively to Club Level guests at this luxury Tysons Corner hotel, are hosted in the Club Lounge, situated on the 24th floor and overlooking the most upscale shopping district in the area. Throughout the remainder of the year, the series will host events that appeal to a variety of interests. Guests who want to look and feel better can get advice and guidance from the skin specialist at The Day Spa, who will address anti-aging treatments and unveil a new facial product that aims to firm and plump skin. Feeling good is not all about surface changes; working from the inside out can offer in long-lasting results. On November 16 from 3 to 4pm, the Potomac River Running Company will be on hand to answer questions about local trails, share information on upcoming running events and give guests a first look at new products and services. On January 18, guests can get a little help upholding their resolution to stay in shape from Tysons Playground owner Ken, who will offer advice on making fitness fun. Whether guests are enjoying a weekend getaway in Virginia or extending a business trip, the Club Level Experience Series also features events to help prepare for the holidays. On November 22, begin the day at 11am with experts from Burberry, who will offer guidance on finding the perfect gifts. And on November 30th, from 3 to 4pm, Paul Bakery will present delicious treats including French-inspired pastries and gourmet breads, perfect for gifting or adding to a holiday dinner table. To learn more about the Club Level Experience Series at The Ritz-Carlton, Tysons Corner, visit www.ritzcarlton.com/en/Properties/TysonsCorner/ClubExperience/Default.htm or contact Kylie Fitzgibbons at 703-506-4300, extension 7103. 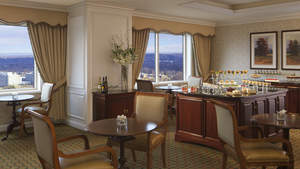 The Ritz-Carlton, Tysons Corner hotel is the ultimate in luxury, prestige and convenience. Located just outside of Washington, D.C. in Northern Virginia's most exclusive business, dining and shopping district, the Tysons Corner Mall hotel invites guests to indulge in soothing spa therapies in The Day Spa, devour delectable cuisine and sample more than 40 wines by the glass in Entyse Wine Bar & Lounge, or simply spend the day shopping at the adjacent Tysons Galleria. For more information or reservations, please call (800) 241-3333 or visit http://www.ritzcarlton.com/en/Properties/TysonsCorner/Default.htm. The Ritz-Carlton Hotel Company, L.L.C. of Chevy Chase, Md., currently operates 83 hotels in the Americas, Europe, Asia, the Middle East, Africa, and the Caribbean. More than 30 hotel and residential projects are under development around the globe. The Ritz-Carlton is the only service company to have twice earned the prestigious Malcolm Baldrige National Quality Award which recognizes outstanding customer service. For more information, or reservations, contact a travel professional, call toll free in the U.S. 1-800-241-3333, or visit the company website at www.ritzcarlton.com. The Ritz-Carlton Hotel Company, L.L.C. is a wholly owned subsidiary of Marriott International, Inc. (NYSE: MAR). A stay at The Ritz-Carlton, Tysons Corner is about more than simply a place to rest after a long day; it is about finding moments for reflection, exploration and discovery.